Request a brochure. Please call us to request more than one brochure at 800-882-7529 or put the number of brochures requested in the comments box. Send me a poster too! A special thanks to all of our brochure sponsors! See them on the following pages: places to eat, places to stay, things to do! 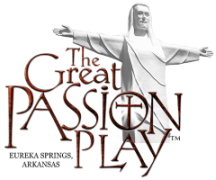 We will keep you updated once or twice a month with the exciting things going on at The Great Passion Play!